"[Science] is more than a school subject, or the periodic table, or the properties of waves. It is an approach to the world, a critical way to understand and explore and engage with the world, and then have the capacity to change that world..."
President Obama has articulated a clear priority for STEM education: within a decade, American students must "move from the middle to the top of the pack in science and math." The Obama Administration also is working toward the goal of fairness between places, where an equitable distribution of quality STEM learning opportunities and talented teachers can ensure that all students have the chance to study and be inspired by science, technology, engineering, and math—and have the chance to reach their full potential. 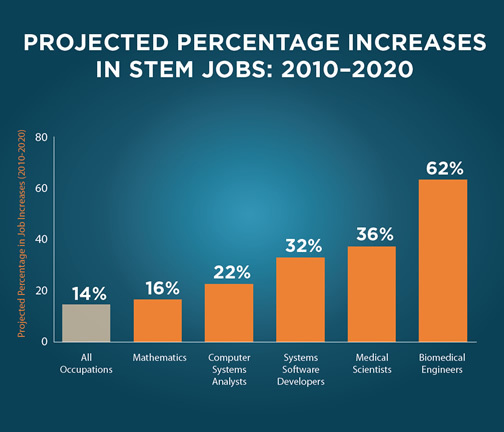 The Committee on STEM Education (CoSTEM), comprised of 13 agencies—including all of the mission-science agencies and the Department of Education—are facilitating a cohesive national strategy, with new and repurposed funds, to increase the impact of federal investments in five areas: 1.) improving STEM instruction in preschool through 12th grade; 2.) increasing and sustaining public and youth engagement with STEM; 3.) improving the STEM experience for undergraduate students; 4.) better serving groups historically underrepresented in STEM fields; and 5.) designing graduate education for tomorrow's STEM workforce.